Today, I’m pleased to welcome a friend and fellow author to my blog, Mr. Bob Doerr. Bob served our great nation for twenty-eight years as a criminal investigator in the Air Force. His background is exceptional. He graduated from the Air Force Academy and also later received a Masters in International Relations. Bob is a counterintelligence expert, having worked espionage and terrorism cases all over the world. Learn more about Mr. Doerr at his website: Bob Doerr, Author. Please introduce yourself and tell us about your writing journey. I grew up as a kid in a military family and then spent nearly thirty years in the Air Force in a small organization known as the Air Force Office of Special Investigations. After the Air Force, I spent eight years as a financial advisor. For the past five years, I’ve been writing professionally and have thoroughly enjoyed it. To date I have had five books published, all in the Jim West mystery/thriller series. I try to write just about every day, but probably average five days a week. I have written short stories and have been published in two anthologies, but for the most part I write novels. I know that you recently won a prestigious writing award for one of the books in your successful Jim West series. 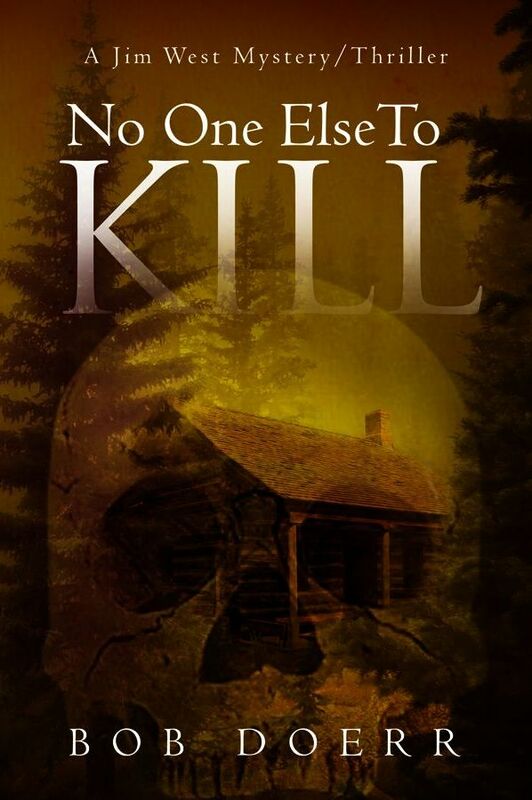 My book, No One Else to Kill, was selected as runner-up to the winning book in the commercial fiction category of the 2013 Eric Hoffer Awards. The Eric Hoffer Awards are held annually and are open to any book that is published in English by anyone except for those books published by the big six publishing houses. The books can come from mid size presses, university presses, very small publishers and can even be self-published. This is a very large contest with 1000 – 1200 books submitted for consideration each year, so as you can imagine, I was extremely pleased to have my book selected as runner-up. No One Else to Kill was also selected as a Finalist for the DaVinci Eye award in the same contest that is awarded to the book with the most outstanding cover. What authors most inspire you? Tough question! I read a lot when I was younger – guess I still do, so it’s hard to pick out the authors that have inspired me the most. Guess I would pick John D. MacDonald, Rex Stout, and maybe Sir Arthur Conan Doyle. Getting emails from people I don’t know who say they have just finished one of my books and have really enjoyed it. I’ve gotten comments from India, Australia, and Canada, in addition to those from here in the USA. I have also found it very rewarding to have met other authors and people involved in the writing world. Where and when do you write? Do you create a certain environment for writing, i.e., certain music playing, favorite chair, etc.? I like to go out to a coffee shop and write. It gets me away from everything, and I seem to be able to focus better despite the crowds or noise around me. I do most of my rewriting at home where I have a large desk in our master bedroom. I don’t put on any music, nor do I create any special environment to help me in my writing. I enjoy writing and find it easy to dedicate time to do it. I wrote a short novel with the assistance of my twelve-year-old granddaughter. It’s a fantasy targeting middle grade readers and should be out late summer. Currently, I’m working on an international thriller that will not be part of my Jim West series. Hopefully, that book will be available by the end of the year. I do plan to write more books in the Jim West series, but not this year. Is there anything else you would like to share with our readers? I like feedback and would encourage any of your readers who happen to read one of my books to kindly let me know what they think. I also want to thank you, John, for having me on your blog. You’re welcome, Bob. Thanks for sharing your background and writing career with my readers, and good luck in all your future writing endeavors.